Sudowoodo in game: 504 Who? Important notice! 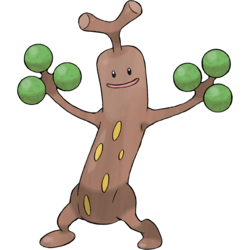 Pokemon Sudowoodo is a fictional character of humans. In Generation II, its remakes and Pokémon Emerald, wild Sudowoodo can be found blocking the road in inconvenient locations in Johto and Hoenn. In order to catch one, a Trainer must first alert it by squirting it with water from either a SquirtBottle or Wailmer Pail. Sudowoodo disguises itself as a tree and stands along paths to avoid being attacked. Its camouflage fails in the winter, as its forelegs remain green unlike real trees. Sudowoodo is very weak to water and hates it, so it flees when it starts to rain. Sudowoodo can be found living in forests. 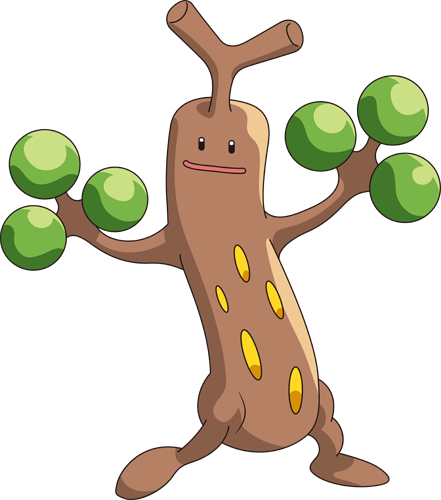 Sudowoodo first appeared in Type Casting. Two Pokémon researchers argue over the issue of whether Sudowoodo is a Grass- or Rock-type. A Sudowoodo was pretending to be part of a tree in Camp Pikachu. A golden Sudowoodo appeared in All That Glitters is Not Golden. A boy named Keenan experimented on his Sudowoodo to give it a resistance against the Water type making it turn golden in color. The Sudowoodo, however, was unhappy with the change, and was reverted to its previous type and coloration. A Sudowoodo appeared in Pikachu and the Pokémon Music Squad. A Sudowoodo appeared in Forging Forest Friendships!. Two Trainers' Sudowoodo appeared in SM006. A Sudowoodo appeared in SM008. A Trainer's Sudowoodo appeared in SM013, where it participated in the Pancake Race. In Smeargle Smudge, a Sudowoodo disguises himself as a tree in the middle of Route 37, hiding from a Rhydon. 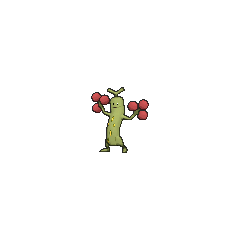 InHow Do You Do, Sudowoodo He revealed himself to Gold after being hit with Polibo's Water Gun. Gold convinced Sudowoodo not to run away from his problems, and Sudowoodo went on to defeat Rhydon in hand-to-hand combat. He soon joined Gold's team and participated in his friendly match against Silver, and later the Masked Man. A Sudowoodo is captured by Emerald at the Battle Frontier. The Reporter speculates that Sudowoodo is female due to her motherly nature towards Emerald. At the end of the Emerald chapter, she appeared to have developed a romantic relationship with Sudobo. In Pokémon Gold & Silver: The Golden Boys, Gold and Whitney battle a giant Sudowoodo which is blocking Route 36 in A Huge Mysterious Tree!!. After defeating it in battle, Gold captures it, and it becomes one of his party members. A Sudowoodo first appeared in Sudowoodo's Toll Charges where it was blocking the way of Red and his Pokémon while they were crossing a bridge. With the help of Clefairy, Sudowoodo was able to get its act together until the bridge that it was standing on earlier collapsed which caused it to walk away sadly. Later, Professor Elm was shown to have one in Participate in the Pokéathlon. 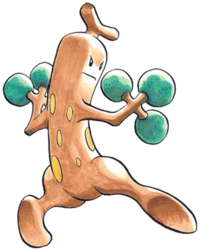 Sudowoodo was made up by Ken Sugimori. In Pokémon Diamond and Pearl, Sudowoodo, along with Skuntank, Togekiss, Fearow and Yanma, weighs as much as the male protagonist of the game. 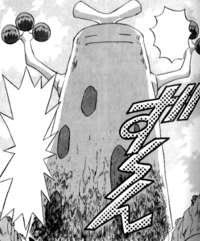 Sudowoodo is based on petrified wood, plants which have become fossilized over time.